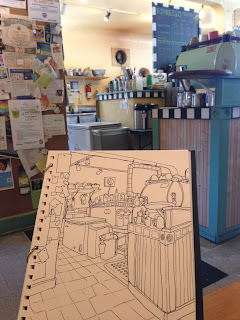 Urban Sketchers Seattle: Irwin's Neighborhood Bakery and Coffee Shop. Irwin's Neighborhood Bakery and Coffee Shop. A long time friend just started working here and introduced me to a rare coffee shop I hadn't drawn yet (I've avoided $t@rbu¢k$ so far). I have a new biking or walking destination not far from home. Thanks, Erin! Im fairly new to drawing but I really like this Style. What pens and colors did you use to draw this? Thanks! Uniball pens and Windsor Newton Watercolors (traveler's set of 12). 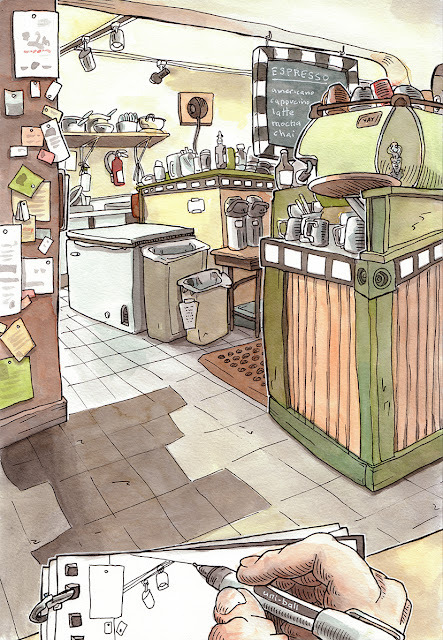 Whether you’re looking for an exquisite cup of coffee or just a place with a casual vibe where you can connect with friends, coffee shop has something for you.